There's no question as to what the defining feature of Enermax's Fulmo GT full tower PC case is from the moment you take it out the box: size. A genuinely massive performance chassis, the Fulmo GT inevitably packs plenty in as a consequence. Dual PSU positions, USB 3.0 inside and out, all-but-universal motherboard support and a multitude of cooling configurations - both air and water-cooling - are obvious benefits that Enermax is keen to push. The space affords Enermax the room to pack a lot more in than that, though, from small details (the always-welcome Velcro strap for the PSU and a removable top cover) to a decent integrated fan controller and an abundance of expansion room (there are 10 PCI slots, and seven water cooling holes). Heck, there are even wheels for the thing, and a braking mechanism included. It's an impressive beast, with a massive amount of working space inside, enabling the deployment of multiple graphics cards and as good a range of cooling options as you could realistically want. Let's temper things a moment, though. It's probably worth noting that there are one or two problems, related to the size of the Enermax Fulmo GT - not least the sheer amount of room you need to house the thing. For instance, while there's a comprehensive cable routing system inside the case (with plenty of room behind the motherboard tray, and an overload of rubber grommet routing holes), you may well find that if you use it, standard length cables from your PSU, for example, won't stretch far enough. Furthermore, you'll need to play with the many cooling positions, and be willing to adjust the default placement of the pre-supplied fans for optimum cooling. Also, appreciating that this is something a little more personal, we didn't massively warm to its visual look. Obviously that's a totally subjective opinion, but it just left us a little cold. Crucially, though, it's hard to think of a performance PC setup that couldn't be comfortably housed in the Enermax Fulmo GT, and with room to spare. There's been a real drive to get the details right, too. Enermax clearly believes in giving you too much here, rather than too little. The front panel is a good example: it's crammed with options, whether you want to use them or not. It's a case that's utter overkill for an air-cooled PC, to be fair, but one that comes into its own for water cooling. 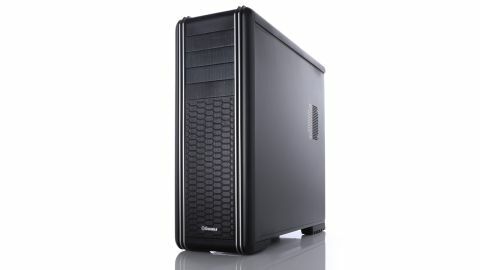 Also, the Enermax Fulmo GT is competitively priced, at around £200 (around $310) - it's much cheaper than, for example, the Lian Li PC-Z70 - and a robust chassis, too. It might have an element of overkill about it, but you certainly get your money's worth. The sheer flexibility here is terrific. The multitude of air and liquid cooling options, the amount of working space and the room means the Enermax Fulmo GT will accommodate pretty much any home PC configuration. There are also lots of welcome little details, from the integrated fan controller through to the intelligent drive cage deployment and SATA connector cover. Plus it's very competitively priced, particularly for its size. There are one or two inherent problems to its size (it's massive) and design (which loses the luxury tinge a little). Plus you might need to get a longer cable or two in. The Enermax Fulmo GT is overboard for air cooling, and terrific for water cooling, but either way, it's a competitive chassis for its price and scale.